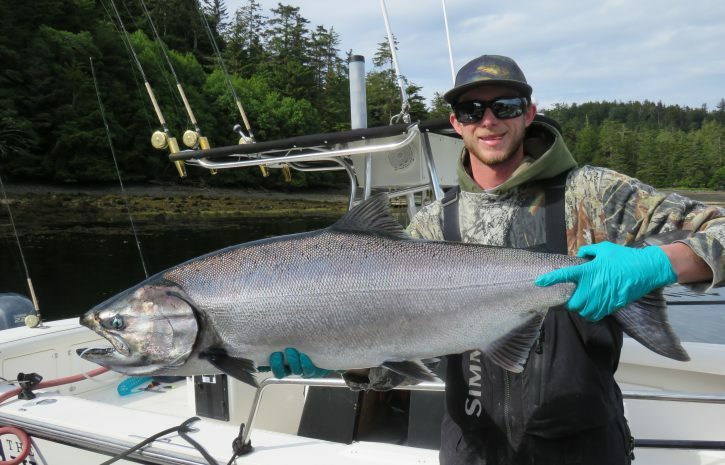 A hot sunny day here at Langara, fish are still actively biting and our final trip is about to get underway. We are the last lodge operating here on the top end of the Charlottes, and what a bonus that is. Fish, weather , and wildlife are all co operating, and we look forward to getting our fresh arrivals out on the chuck in an hour. 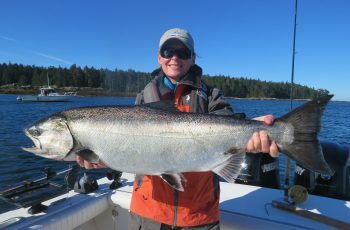 Our last guests retained 62 chinook, largest fish a released tyee angled by Nicole Goodson. 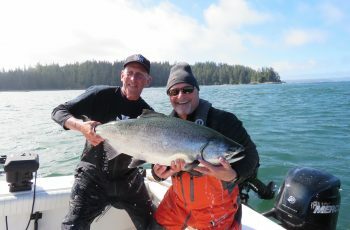 Pretty cool to have caught and released the only tyee of the trip, well done! A very good chance that fish will make it home to spawn. 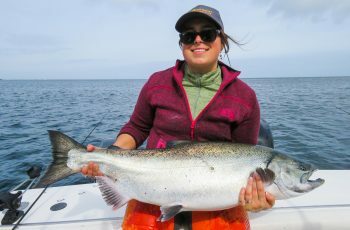 Nicole grabbed a 14 lb coho in my boat, what the sam heck? She had largest coho and chinook honours.! First time angler too, hope to have you hooked now and see you again. Budd took a group out in the wind and rough halibut fishing off Mac. 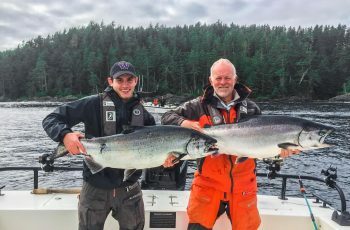 His boat ground out a released 150 lb halibut for Roli Hebron, Irv Bertram grabbed an 81 lb fish. Some of the boys beat they’re way down to the Jalun in a Northwester, looking for chicken. Mixed results, with Korey a victim, blew his back out in the wind and chop, now day to day game time decision, we are going to have to send this guide in for a total refit at the end of the season. Sharks, sharks, sharks, are making the annual appearance off Coho, mostly salmon sharks, pesky at times too. 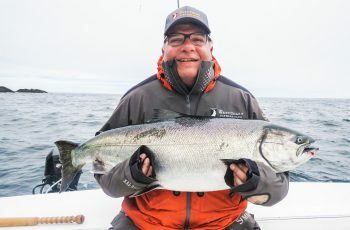 We are losing some hook-ups for sure, and the odd small spring and coho has a nice bite out of the side. Bryce claims a 6 footer to the boat, hard to say on that, but his voice was so shaky and his limbs trembling profusely, maybe he did see a monster. At this point Bryce sounds pretty rough, could be put on that disabled list himself. Most of the guides wrap up on Sunday, and head out on Monday. We then spend some time putting away the boats and getting them to Masset. Rod over at North Island Lodge pulled out on Wed afternoon, heading south at 5 knots, should be back in Van from the tow early next week. Last year Rod ordered a thanksgiving turkey, yuppppp he never was on his way home with the barge to the end of September.